I’ve been on a decades-long quest to find the perfect chocolate chip cookie recipe – and I’m sure many of you can say the same. My ideal chocolate chip cookie is one that’s chewy, dense, and loaded with chocolate chips. I had heard rave reviews about the New York Times chocolate chip cookie recipe before, and thought I would give it a whirl myself. What Makes This Cookie Unique? This recipe is a little different than other chocolate chip cookie recipes, namely because once you make the dough, it must chill for 24 hours – and up to 72 hours. This allows the dough to settle and the flavors to come together. 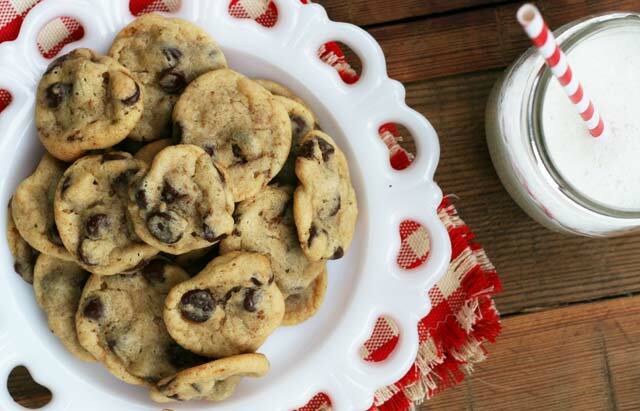 So was this the perfect chocolate chip cookie recipe? I must say that it was pretty darn good. Soft, chewy, and chocolaty. But to be honest, I enjoy trying new chocolate chip cookie recipes, and don’t think I’ll ever stop experimenting. I would love to hear your thoughts about this recipe. Please share your comments below! I made a slightly modified version in an attempt to re-create the famous Sweet Martha’s cookies from the Minnesota State Fair. Get the copycat Sweet Martha’s recipe here. Cheap recipe tip: To make homemade cake flour, take one cup of all purpose flour, remove two tablespoons, and replace with two tablespoons of corn starch. Sift several times before using to ensure light flour. To make dough: In a large mixing bowl, sift together flours, baking soda, baking powder and salt. Set aside. Using an electric mixer, cream together butter and sugars. Mix for about five minutes to ensure a light and creamy texture. Add eggs one at a time, mixing well after each addition. Pour in vanilla and mix well. Add flour mixture to butter mixture and stir until combined, avoiding over-mixing. Add chocolate chips. Place plastic wrap over dough and refrigerate for at least 24 hours and up to 72 hours. Baking instructions: Preheat oven to 350F. Place dough by rounded tablespoons onto a cookie sheet. Top with a few flakes of sea salt. Bake for approximately 11 to 13 minutes, or until light golden brown. Remove from oven and let cookies cool on baking sheet for 10 minutes. Transfer to a cooling rack and allow cookies to cool completely. i made & blogged these too – nothing but rave reviews! i really think they deservedly win for “best”! I am going to have to try these! They look amazing! Chocolate chip cookies are my favorite!